The reason why this is the Independence Day edition is that it's the Fourth of July here in the U.S. And everywhere else in the world. Har har! And that, my friends, is the extent of that thematic grouping. I just needed a subtitle, to be honest. 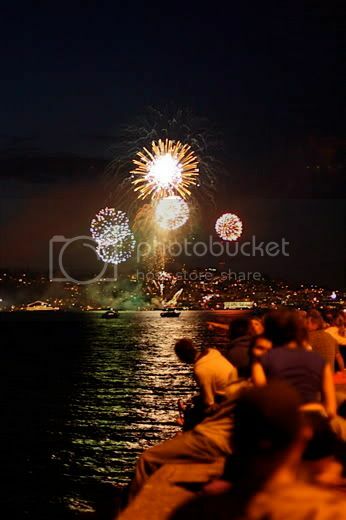 I will say, though, I'm disappointed that this year we won't be able to just walk down our street and watch the fireworks over the water. They've canceled the ones we used to be able to see, and I don't feel like fighting traffic to watch the other ones. Sigh. Mikko's very first Fourth of July fireworks celebration, at one month old. He was unfazed. We will instead be staying home and keeping our cat company through the endless rounds of firecrackers going off outside our windows that spook her each year, so there's the silver lining. For our cat. All right, on with the non-fireworks show! Don't bother looking for independence references in the links that follow, because you'll be hard-pressed to find them. Bilingual fans! Join the "party with the word nerds!" from Bringing up Baby Bilingual: "A virtual party for us 'Language Nerdos'" aka the Blogging Carnival on Bilingualism's latest installment. You can find my post about finding children's songs online, alongside posts from illustrious company. And I heartily recommend the ebook "Parenting auf Deutsch - German Phrases for Parents" from Alphabet Garten: "Many parents can comfortably hold a conversation with other adults in German, but are at a loss when trying to discuss bedtime, homework, or bathroom needs with their kids. German classes usually don't teach this kind of stuff. You have to learn it on the job." Sign up for the Alphabet Garten email newsletter and download this awesomely helpful ebook for free. If no one has put a guide like this together for other languages, someone totally should! This is exactly the sort of thing a non-native speaker needs to feel comfortable parenting in another language. "It is okay to talk to strangers" from Together Parenting: At the same time I was writing my Amy Adele's idea about calling cards for parents and bloggers, Cassie at Together Parenting (unprompted by my thought waves) was making her own calling card and working up the courage to give it to a random but simpatico-looking stranger. And then she designed an innovative one with lines on the back to get printed up at VistaPrint. Kudos to her for actually doing what I was thinking about doing. "I am going to build a little social network not hide at home alone, even if I have to challenge a few social norms to do it." Right on! I love this collection of (almost) 2-year-old updates from My World Edenwild: "Baby-led weaning update", "Breastfeeding an almost two year old", and "Diaper-free, finally." Often people write about these topics when they first start, but to look back and see how it all turned out at the end (of BLW and EC, anyway) is fascinating. "If Spanking Does Not Work in the Long-Term, Why Start Spanking at All?" by Code Name: Mama at API Speaks: Since spanking has no long-term effectiveness (even an hour after a spanking), why not choose a better discipline tool in the first place for the parenting toolbox? "Free Kid's Music" from Flexible Dreams: Great suggestion to start a Pandora children's station! Not a recent post, but recent to me. "Casual Remarks" and "But Wait, There's More: The Problem of the Cat's Weight" from Swistle: On how a cat who is twice her "recommended" size can live a long and healthy life and become a "healthy" weight only when dreadfully unhealthy. Consider, as Swistle admirably does, how this applies to human bodies. "I tried on my wedding dress today" from This Is Worthwhile: The first post I've read where someone doesn't fit into her wedding dress anymore but is happy about it. "'It Hurts Down There' A Lesson in Disposable Diapers" from Peaceful Parenting: We used cloth the whole time we were diapering/EC-ing, except — as in the article — when we were traveling. And that was the only time our baby was irritated by diapers. Frankly, so were we, and eager to get back to our cloth! "Letters to my past self" from A Gift Universe: I liked this look back at the choices we make — and the charitable tone within. "Sexing the breast" from Spilt Milk: Another nuanced post about how breasts serve multiple purposes — and in the end belong to the owner to use as she pleases. 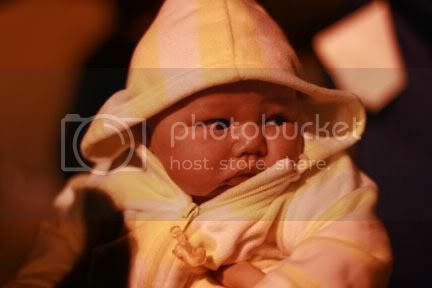 "Infants should always be visible and kissable in a carrier. "Any carrier should hold the baby the way you would hold the baby in arms." I also want to highlight an excellent guest post from Dionna of Code Name: Mama on "Tips to help parents assume the best intentions": When your kid is acting in a way that pushes all your buttons, it's time to take a deep breath and make sure you're seeing the good behind the apparent misbehavior. It's not easy, but whenever I do, I'm always relieved I was really listening and respectful rather than assuming the worst and flying off the handle. Share your tips and experiences in the comments, too, and many thanks to Dionna for carrying forward the conversation on that topic in her usual insightful way. You can find more shared items during the week at my public Google Reader recommendations feed. Unfortunately, I sort of slacked off at putting my recommended articles in that list this week. Whoops! 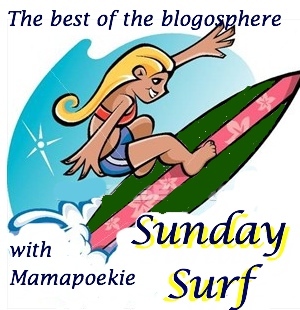 Check out Authentic Parenting and Baby Dust Diaries for more Sunday Surfing! I have a Pandora kid's station. Love it. I can pick the good folky ones and discard the annoying ones. That sounds excellent! I love Pandora for me. oooh i love your blog! i'm so glad you found me, so i could find you. i'm adding you to my blog-roll, mama-friend. peace to you. Definitely entertaining reads. Your site makes being a parent very fulfilling and enjoyable. Thanks!